When you need commercial cleaning you can depend on, choose the specialists with more than 15 years of experience. 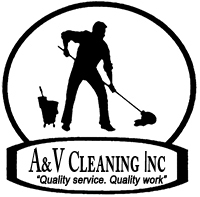 A&V Cleaning Inc. of Cleveland, Ohio, is your source for dedicated cleaners that care about your business. We meet and work with you according to your schedule for your convenience. A&V Cleaning is committed to ensuring the safety of your office or construction site. Each team member we employ must pass an extensive background check. Our team is fully insured and is proud to carry an accident and incident-free record of accomplishment to every job we undertake. Contact us today to recruit our team of commercial cleaners when you need a thoroughly tidy business or construction site.